The origins of Stuttgart can be traced back more than 1,000 years ago, when Duke Luitolf of Swabia founded a stud farm (a “Stuotgarten”) in the region. It was this farm that later became the inspiration for the rearing black stallion on the city’s coat of arms. Since then, Stuttgart’s growth has been gradual. For centuries it was overshadowed by Cannstatt, which lay on the crossroads of major European trade routes, but is widely regarded as a suburb of Stuttgart these days. That’s because Stuttgart grew during the Middle Ages when it was fortified by the counts of Württemberg, who built a fort on the site now occupied by the Old Castle. From 1520 to 1534, Stuttgart belonged to Austria. 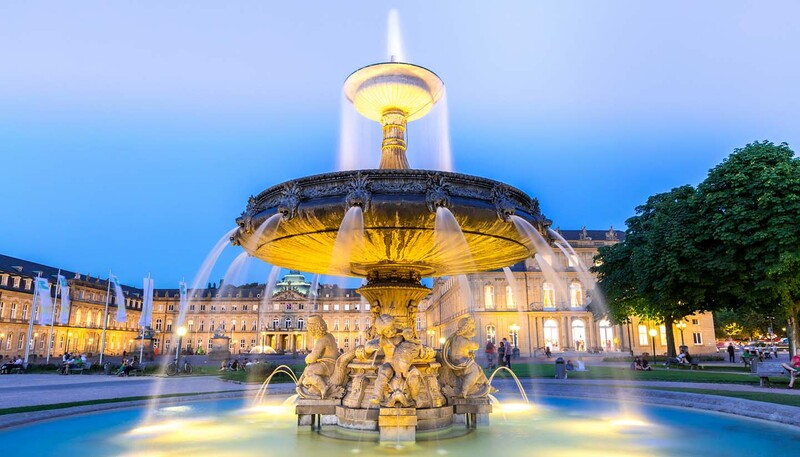 The People’s Fair, which has since morphed into an annual three-week autumnal celebration and beer festival, was first introduced to Stuttgart by King Wilhelm I in 1818 following years of famine and widespread crop failure. Although often associated with the philosopher Georg Friedrich Wilhelm Hegel (who was born here), Stuttgart owes more to Gottlieb Daimler, who helped pioneer the motor car, and inventor Robert Bosch, whose huge engineering and electronics company still bares his name and provides jobs in the region. Stuttgart became the capital of Württemberg in 1918, and when Baden joined with Württemberg in 1952, the city was named the capital of Baden- Württemberg region. The US military made Stuttgart the headquarters of its forces in Europe and Africa (EUCOM), a presence that helped the city reconstruct following major structural damage in WWII. A focus on high quality machinery, engineering and exports then helped Stuttgart become one of the centres of the German Wirtschaftswunder (‘economic miracle’) that came about during the post-war restoration. Stuttgart made headlines again in the 1970s as it was the trial venue of the Baader-Meinhof Group, a terrorist organisation responsible for murders as well as bomb and arson attacks. Three members were given life sentences. • The museum at the Old Castle is dedicated to Claus von Stauffenberg, a Stuttgart resident who tried to assassinate Adolf Hitler in 1944. • Started in 1956, the TV Tower in Stuttgart was the first in the world to be constructed from concrete. • Wine has been grown in Stuttgart since 1108. The historic vineyards cover 2 percent of the urban area of Stuttgart.